A devastating fire destroyed our home after 92 years on Neilson Street in New Brunswick. The beautiful edifice is gone, but the spirit of the Chevra remains alive and strong, even after the loss. With the help of Ha-Shem, and the generosity of Klal Yisrael, we will rebuild and again have our own home. The heroic saving of a sefer torah by our Rabbi, Rabbi Abraham Mykoff, exemplifies our devotion and determination. Anyone wishing to can make a contribution to Congregation Poile Zedek by donating by credit card here or mailing a check to P.O. Box 166 New Brunswick, NJ 08903. 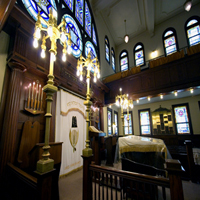 Congregation Poile Zedek is an Orthodox Ashkenazic synagogue located in New Brunswick. 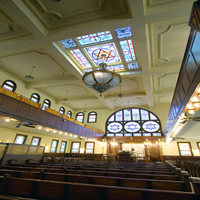 In 1995 our beautiful building was placed on the National Register of Historic Places. 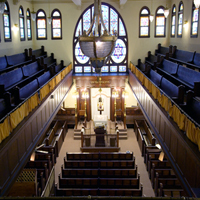 We offer daily morning, Shabbat and holiday services, and are committed to Torah education and community service. Please join us. friends and family or remember a loved one. or cards can be purchased singly for $5.00 each.